Tempo Travel is Another type of Mini Coach which Has various Models starting from 12 Seater and Up to 27 Seater Launched recently. One of the Most Loved Transport Vechile In India has Gud Space, Height and Luggage space in the Vechile. Force Motors india is The only Company in India Making the Kind of Vechiles as off now But soon Toyota and Other Companies are looking forward to take over the Market. 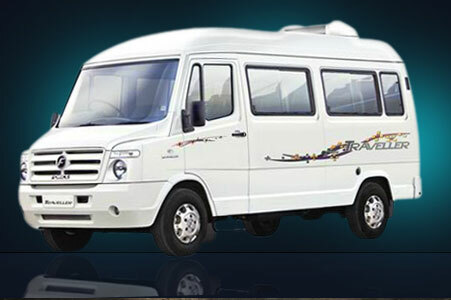 Tempo travel hire in rajasthan is a Gud option for Travelling along with Family and friends as the Mini coach is Quite comfortable and Spacious as well as Has Gud Ac and other aminities like charging points, music sysyem with pendrive and Mini Tv for watching movies. As we all know rajasthan is one of the Most Popular Tourist destinations in India. The land of Kings and Queens has a Vibrant, history, Heritage Forts and palaces, colourful Textiles and impressive Gesture to it’s Visitors along with Memories for Life time. Our Company has Tempo travel for hire in ajmer for Outstation or Local city tours and sightseen services. We have 12 Seater tempo and All other models like 15 Seater and 17 Seater as well. The mini Volvo kind of Coaches Have gud interior and Comfortable Seating system alomg with Ample Luggage space in the back. And Budget of the clients. We also provide Transport only services to Major Companies and Corporate Sectors throughout the State. We Welsome tours starting from Any point or City in rajasthan and Provide Luxary tempo travel hire in Rajasthan From any City to Any other city. Our Wide network of Travel professionals and Long Experience of 15 Years will Give you the best Value of your money and time. Our wide knowledge regarding the routes, Roads and Monuments will help you to Design Best rajasthan tour package for your Friends, family. We provide Quick response to your Queries and we are available Online and offline. Our Helpful Staff, Drivers and Customer care support will be always happy to hear your Feedbacks, Suggestions and Advices to Improve our services and Quality. Nearest airport to ajmer is Jaipur which is only 135 kms and the distance can be Covered in Easy 2Hours and 30 minutes We Have Special Rates for Jaipur airport to ajmer tempo travel one way services as well as Jaipur ajmer pushkar family tour trip for weekend or Family visit to Ajmer sharif Dargah and Pushkar town.